Zino Platinum Z-Class | Chicago's Pipe, Cigar & Tobacco Store | Iwan Ries & Co.
Zino Platinum Z-Class Series offers the same standard features of any Zino Platinum cigar with an exhilarating fresh twist and packs a punch. The new blend features a Dominican wrapper accented by a Peruvian binder and Nicaraguan, Honduran, and a small amount of Dominican fillers. These carefully selected, aged tobaccos create a spicy medium-to-full bodied cigar. Each of the four vitolas has its own unique strength, flavor and aroma to allow for maximum smoking pleasure and variety. 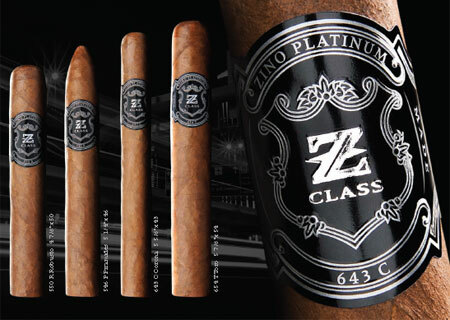 The power of Z-Class comes from a Dominican wrapper, Peruvian Pelo do Oro Visus binder and Jalapa Especial Ligero, Esteli Ligero, Cuban Seed Ligero, San Vicente Ligero filler tobaccos from Nicaragua and Honduras. The packaging continues to be innovative: All formats are packaged in an attractive and modern custom tin of 20 cigars.